At the National Library of Medicine (NLM), what you see is not all you can get. 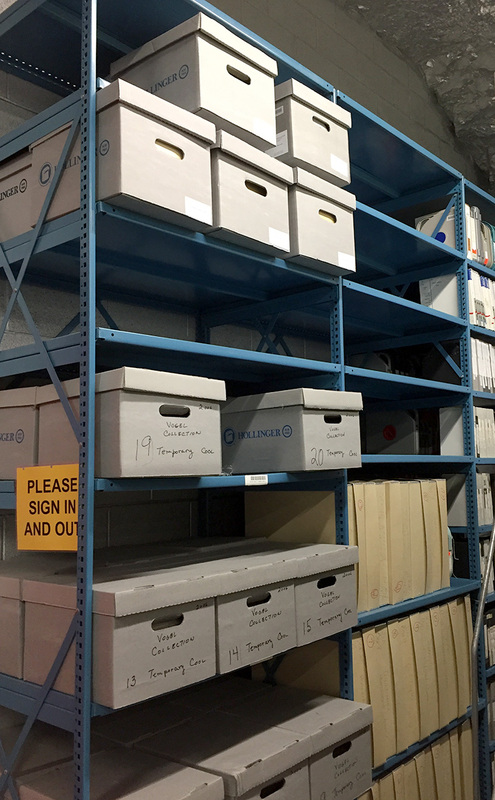 The library stores thousands of original film reels offsite, along with master videotapes, cabinets full of microfilm, and some boxed, unprocessed collections yet to be assessed by staff. 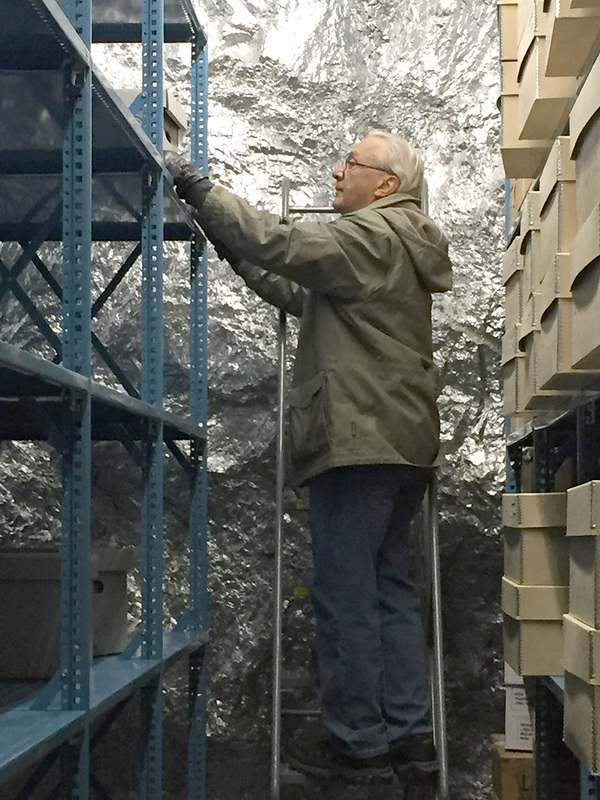 Like hundreds of other agencies and corporations, including the Internal Revenue Service and Warner Brothers Pictures, NLM’s material is kept at optimal temperature and humidity underground in a converted limestone mine in western Pennsylvania. United States Steel operated the mine from the early 1900s until 1950. After that, some of the property assumed a new identity as a secure storage vault. National Underground Storage bought space in 1954, and Iron Mountain, Inc. took that over in 1998. Iron Mountain houses paper records, audiovisual formats, and other objects in locations worldwide. The company also provides data storage and management. In May of this year, four NLM staff set out for “the Mountain,” which is really a giant cave near Boyers, Pennsylvania. The Library leases two vaults for our material, a cool vault where magnetic tape and microfilm are kept at 55 degrees Fahrenheit, and a cold vault containing films, maintained at around 35 degrees. Over the years, the volume of NLM material has grown considerably, and some of it was not well-organized. Staff decided to tackle the twin tasks of confirming what material was there, and better arranging it if possible. We brought coats, gloves, and the excitement and energy that only trained librarians and archivists can bring to such a task. Ben Peterson and Walter Cybulski of NLM’s Preservation and Conservation Management section accompanied Sarah Eilers and Jim Labosier of the History of Medicine Division. Once at the facility, we provided identification and were driven in an eight-seat golf cart-type vehicle to the NLM vaults. Most of the tunnels and roads underground are wide enough for an auto, but staff are more likely to zip about in carts. “Street” signs let us know we were traveling down Drill Steel Drive, Carbide Lamp Lane, and North Hard Copy. The network beneath the ground is expansive enough (145 acres) that shuttle buses run through picking up employees to take them to and from the entrance. Iron Mountain sits atop an underground lake, which is used to cool the complex. 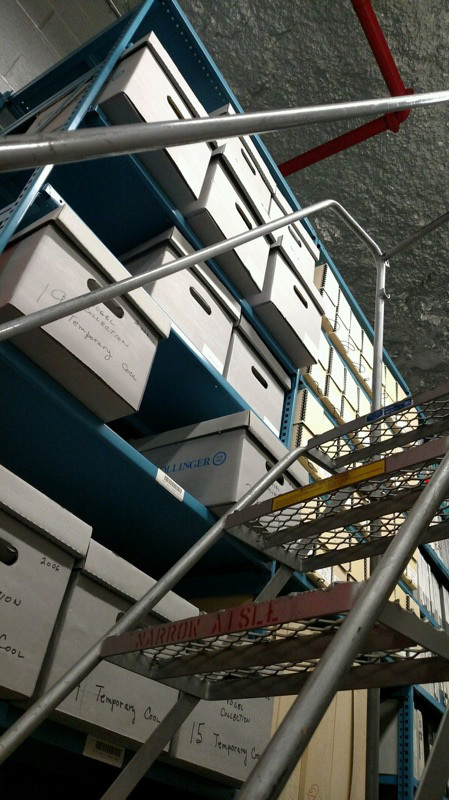 We peered into containers and drawers, moved boxes, disassembled and reassembled shelving, moved more boxes, compared film can titles in the vault to a list of NLM holdings generated beforehand, and finally, moved more boxes. Though a full reorganization of film cans remains to be done, we accomplished plenty. On the recreational side, Walter and Jim visited the supermarket, where Walter purchased newspapers (one from every town he passes through) and Jim picked up a candy bar. 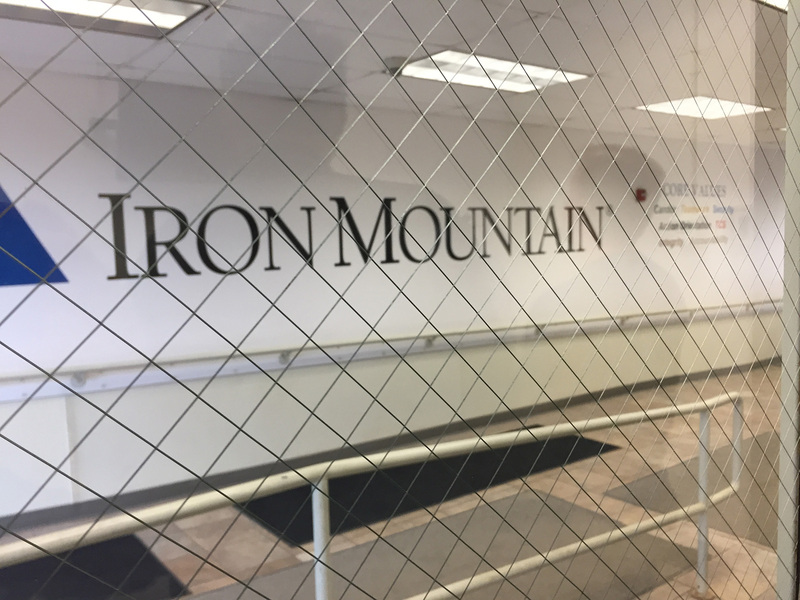 We took photos inside, though Sarah’s casual attempt to capture an image of the Iron Mountain sign outside, at the entrance, was thwarted by an armed guard. Knowing that videos and images of the Mountain are available on the interweb, we were surprised, but no doubt the guard was just doing his job. All of the staff and cart-drivers were helpful and friendly. Plus, the café makes a nice latte. There’s more to accomplish. We’ll be back. Next Post: Circulating Now Celebrates 20 Years of Harry Potter!